Lakes, volcano [sic] and beaches dot the landscape of Nicaragua, set between the Pacific Ocean and the Caribbean Sea in Central America. 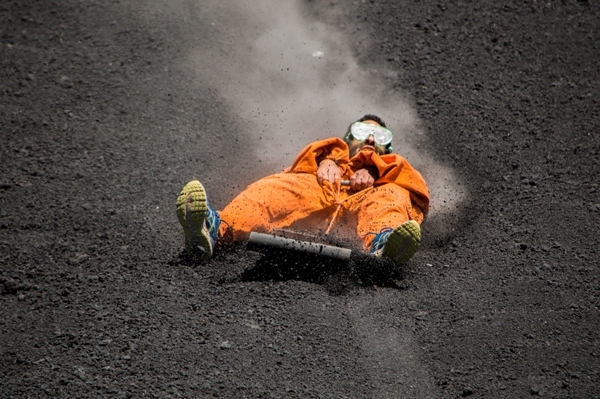 While searching for things to do there, we ran across volcano boarding. Maybe not the most thrilling experience you will have around an active volcano, but a distinctive one to say the least. Yaiza travelled to Ibiza along with 20 other Spanish applicants to battle it out for the two places available for Spaniards. They would be taking part in a blob jump. When it was Yaiza’s turn, she flew much further than expected, slamming into the water face first wearing a home-made astronaut suit. Forget triathlons. The latest fitness trend and fashionable Scandi import is the “swimrun”, a fusion of cross-country running and open-water swimming – essentially a triathlon without the cycling. Originating in Sweden, it is gaining converts here, with thousands of people set to take part in the UK this year. car-driving in any dictionary???? Yet it has been around for a while, right? Few persons anywhere will ever be able to volcano-board. But, almost everyone will car-drive. NEITHER is worthy of being in the dictionary! I completely agree. These ‘new words’ (actually not new at all, just a shortened combination of two separate, established words) are diluting our language! English is the speech of Lords, why are we cheapening it with slang? It is astonishing and embarrassing that we would even consider this mashed-up language as worthy of official recognition. Our children will not be able to read a novel at this rate, if it isn’t re-written and dumbed down into texting format! We are losing our beautiful expressive language, along with cursive writing, which is now not taught in schools. At this rate, true English will end up like Latin, dead and gone.